Anytime access to the site information you and your team need to succeed. Your mobile device can do more than email. Why can’t you? To make confident decisions, you need the ability to access vital store information and market data anywhere. 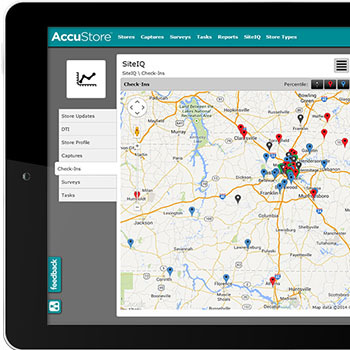 AccuStore empowers your team with seamless, cloud-based access to site-level information. A real-time KPI dashboard gives you all of the data you need to make field tasks easier. It makes your time in store a lot more productive – and saves follow up later. Your store observations sync with the database automatically, so information is instantly accessible. Plus, you may be able to spot trends and analyze store activity in ways that didn’t easily exist before.